Happy Star Wars Day, lovely people! May the 4th be with you!! I figured since I am quite the nerd, that today would be a good day for my comeback post. I am sorry for disappearing off the face of the Earth. My absence was totally unintentional but unavoidable, I’m afraid. On the tail end of my vacation to Texas, I ended up catching the worst cold imaginable. The trip home was horrendous; filled with watery eyes, snotty nose, blocked ears and extremes dizziness. This continued for two weeks straight. Since I take some strong meds for my RA, any cold or ailment is exaggerated and it takes me weeks to get over. So, three weeks into fighting this cold, I was pretty exhausted, miserable and frustrated. Add a week or two of wallowing in self pity and here I am. Somewhat back to normal, but still drained and uninspired. Of course, I couldn’t let Star Wars Day go by and I not do something! It’s like my holiday! The wonderful thing about being a nerd is when you have a husband who is a bigger nerd, and children who also appreciate the nerdier things in life, doing things like this is totally worth it. 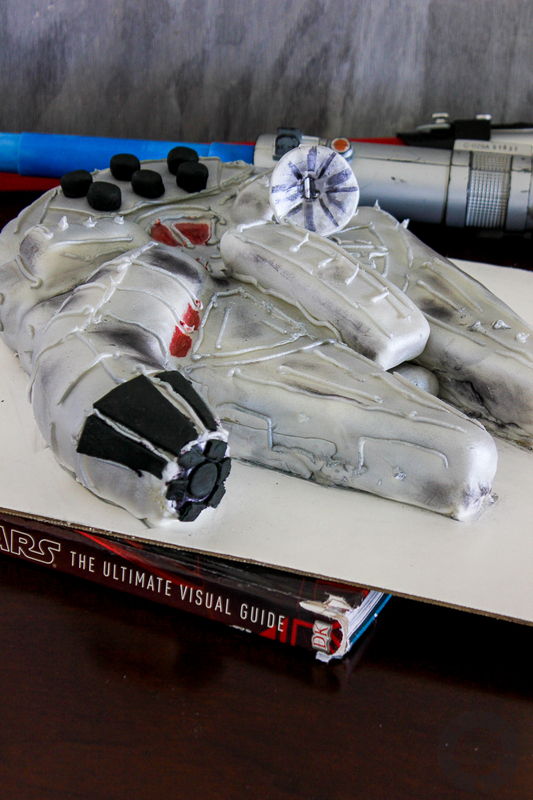 All in all, this Millennium Falcon cake was a hit. My husband’s birthday falls at the end of April which is perfect to start work on a Sci Fi masterpiece because it doubles for his birthday cake and Star Wars Day. I am not going to share the cake ‘to do’ post today because that’s not the post I want. I just want to share my cake with you. This is a cake I’ve been wanting to make for a long time. There are a few logistics but in the end I made my life simpler by making a 2D cake rather than attempting a 3D one, I’m not a professional baker to attempt a 3D! I think it looks good enough. But I am sharing a collage as proof that I did actually make this cake! I will share a how to post later on if there are enough searches and request. I will share my sponge cake recipe however, because it’s just really good. It’s a Victoria Sponge and probably one of my favourite cakes, filled simply with a strawberry, blackberry or raspberry jam. This particular cake is filled with a white chocolate and raspberry buttercream, and oh…. is it good. The white chocolate buttercream I used is from this site, it’s an interesting way to make it, and though it worked out fine, I probably won’t use it again because I didn’t like the lumps of butter that were left unbeaten. But, maybe you guys will have better luck with it. It’s definitely an easy way to make it. I added a few heaping tablespoons of raspberry jam to a portion of the buttercream and used that mixture as the filling. The remaining buttercream was used to frost the cake all over before the fondant went on. A bit of fondant modelling, a paintbrush with food colours, a can of food colouring spray paint, a table covered in errant silver spray and fingers dyed a multitude of colours, my ship was complete. Need two 8" /20cm round tins. Have all your ingredients at room temperature if possible. I often zap my butter for a few seconds in the microwave to soften. Watch it though or else you will have a puddle! If the eggs are cold, I place them in warm water while the butter is creaming. Prepare your two tins (8 inches/20cm) by greasing with butter or spray and lining the bottoms with parchment, and greasing the parchment as well. In a bowl, add the flour, baking powder and salt and mix to blend. In a stand mixer or with a hand mixer, beat the butter and sugar until light and fluffy. Add half of the flour and beat gently. Add the rest of the flour and mix until just blended. Using a spatula mix through by hand. Add a drop more of milk if the consistent is too thick. You want a thick batter easy to spread in a tin but not gloppy and too thick. Divide the batter even,y between the two tins. Place in the centre rack of the oven and bake until golden brown, firm and risen. It will take about 30-40 minutes. Cool on wire racks for 5 minutes. Run a knife around the edges to release the cakes. Once cool, remove the cakes from the tin and if still warm, cool on the rack. When ready to serve, spread your choice of jam, whipped cream or buttercream on one of the cakes and sandwich both cakes together. So, you will see that I have my measurements in weight and not volume. I have tried to make a proper sponge using volume measurements unsuccessfully for the last few years. Tired of always having a bad sponge, I decided to just use weight measurements from now on, they are so much more accurate. I encourage you to do the same. Now, my cake comes out perfect every time. HA bakers: dial back on the baking powder, use just 1¾ teaspoons. I am beyond excited for the new Star Wars movie! I cannot wait till Christmas 2015. I am always happy that I can truly share my enthusiasm with my son. He loves it that his mommy can hold up an entire conversation on light sabres and Jedi masters. Whether you are into Sci Fi or not, Star Wars is just one of those movie phenomenons everyone knows about. The iconic Darth Vader, the unique ships, the cheesy dialogues and just the whole imagination of George Lucas is pretty awesome. So, to all the Star Wars fans today, Happy May the 4th! This cake looks great mA! For Zunoon’s birthday party I made marble cupcakes with white chocolate frosting, and to be honest I wasn’t too impressed with the frosting either. Although I used a different recipe for the frosting, it ended up tasting like regular buttercream. I guess the search continues! Thank you, Henna. I was thinking of you yesterday, hope you’re doing well my dear. Almost there!! That is a fabulous cake! Your whole family are big fans of Star Wars I gather. Nazneen, I’m sorry for you my dear I hope you are fine now and everything will be back to normal again. I love this cake although it really looks laborious!!!! will be waiting for the to do. Very creative! We’ve also seen another version in another blog last week. Both yours and hers were amazingly presented. Thanks for sharing, Nazneen! And have a great Sunday! Hope your husband enjoyed his birthday with this fabulously decorated cake. You’ve done an awesome job. Sorry about you not feeling well. It miserable falling that sick, it’s painful. Take it easy. Warm hugs coming your way. Boom!! And she’s back 🙂 Way to go Nazneen you went all out. The cake alone would have done it for me! I remember the first Star Wars movie coming out – in the days when you couldn’t pre-book tickets and you had to take your chances and queue up at the cinema. The queue stretched around the building and we queued for hours and then couldn’t get in. We had to try 3 times before we got to see it! Awwww! This is so awesome! I love how creative you are! Welcome back! You chose an excellent day to return — May the 4th be with you, indeed. 😉 Terrific looking cake — work of art. Thanks for this. Nazneen!!!! Welcome Back!!!! So sorry you have been so ill – there have been some nasty, lingering bugs going around here in Atlanta too! I gotta say this is one heck of a cake to comeback with! I did not know that there was such a thing as “food colouring spray paint”!!! This looks so good – love the filling and would love to see a “how-to” guide as this simply amazes me! Thank you, Shashi. It’s been a horrid year for colds and flu. It’s a strain that doesn’t go away! You won’t believe what’s available these days for cake decorating!! Welcome back, Nazneen, and I am glad that you are feeling better now. The cake looks very impressive! Thank you, Angie!! I’m getting there slowly but surely! Oh my dear, I caught a horrible cold from my daughter a couple of months ago and thought I was going to die . . . or go deaf at the very least. Well I am happy to say I recovered my hearing and feel much better but it did take awhile. This cake is a masterpiece! I thought I would never hear again!! It was awful. I hope you are better. I’m still dealing with popping ears and my runny nose is back . Let’s get together soon!! Maybe we should chat about Star Wars sometimes. I keep getting shut down over in this house. Thank goodness, little man is starting to catch on. (: Love the cake, sounds so delicious, I might make it for breakfast! What is better, the raspberry/blackberry jam or the jam/buttercream filling? I’m leaning toward jam, but wondered what you thought. Hugs! Oh we can definitely chat about Star Wars!! I do know that SW is not really a desi thing. Which explains why you’re getting shut down 🙂 The cake is awesome and my fave way is just with jam. I have a bunch leftover, you can always come over! I mean… that is some pretty cool stuff, lady.